Do you remember the headache that Brazilian visas used to cause? To apply, you had to visit an embassy, pay $160, and wait. Not efficient. The South American country briefly relaxed its policy in 2016 in the months surrounding the Summer Olympics. Then an e-visa service, created to attract new tourists, made it even cheaper ($40) and quicker (four to five days) last year. Now Brazil is dropping visas altogether for American citizens. So what’s on your Brazilian wish list? Rio de Janeiro. Iguazú Falls. São Paulo. Manaus. Tiradentes. All great spots. But you’ve been to each of them before. It’s time to mix things up and try somewhere new. A beach sounds good. The country does have more than 4,500 miles worth of coastline after all. 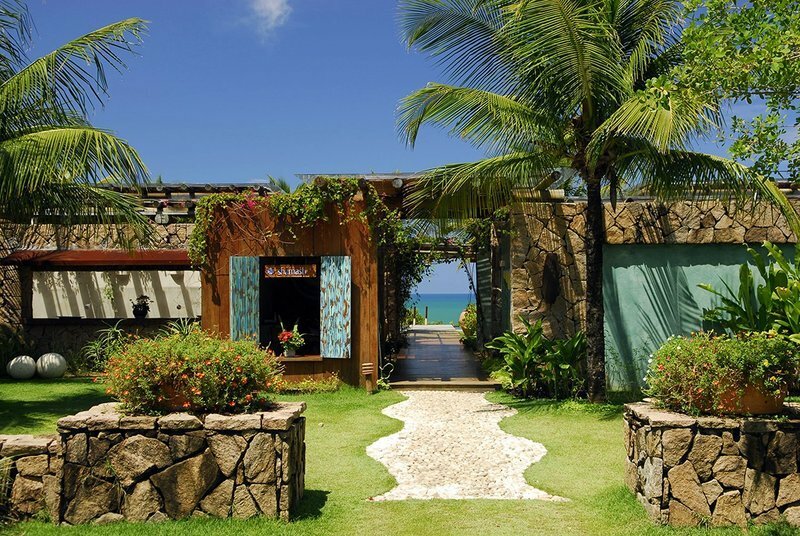 You’ve been dreaming about Trancoso, a boho beach town in the northeast state of Bahia. So has everyone else. But Bahia is Brazil’s fifth-largest state. So it takes up a good portion of that coastline. You should head 230 miles north to the Cocoa Coast instead. This region was named after the cocoa plantations that lined its coast in the 17th century. The 45-miles stretch lies in between Itacaré and Ilhéus. It has small towns with stone streets and colonial houses. State parks and preserves protect one of the last large expanses of the Atlantic Forest left in the country. Forest trails meander around mangroves, waterfalls, small coves, and lagoons. They all end when they meet the Atlantic Ocean. One of the most gorgeous beaches, Praia de Itacarezinho, lies 11 miles south of Itacaré. The unspoiled beach extends for more than two miles. A small jungle waterfall lands directly on its golden sand. The emerald water is consistently warm. Constant waves always lure surfers. Plus a chic beach resort is hidden among the palm trees. The Txai Resort looks like a little village. It’s part of a former coconut and cacao farm. Its 227 acres sit against the Itacaré/Serra Grande Environmental Protection Area. Sandy roads, traversed only by golf carts, and stone paths wind through thick green foliage. Stilted bungalows, made of bamboo and palms, are tucked off to the sides. Three restaurants, fours bars, five pools, and a hilltop spa are also hidden on the property. It immediately feels like home. Your first stop is your premium bungalow, of course. 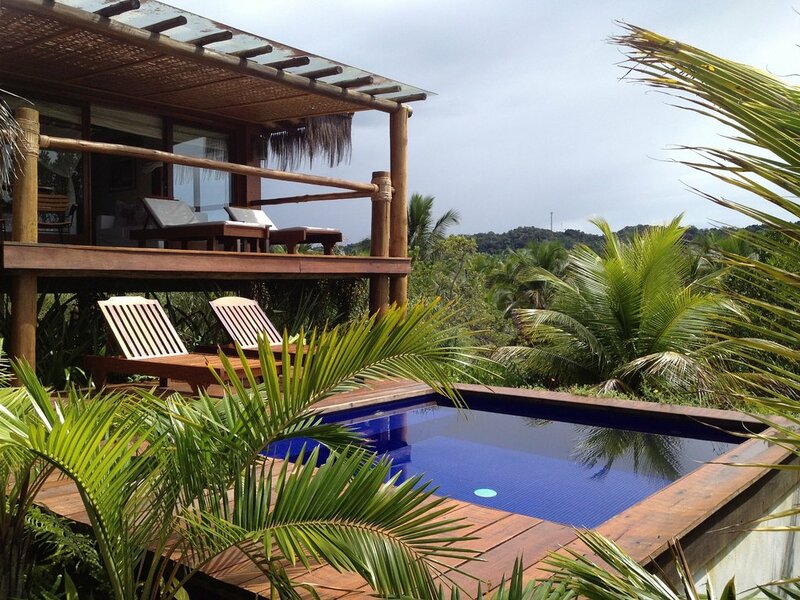 You upgraded for two reasons: the ocean view and the private plunge pool. It has a four-poster bed, an outdoor shower, and a 12-bottle wine cellar, too. After checking out every inch of the room and gawking at the uninterrupted view, you make your way to the nearly empty beach. A long pool overlooks it. So does Praia, a beach restaurant with tables sitting on the sand and white hammocks strung between the palms. You kick off your flip-flops, order a caipirinha—only Brazil’s national cocktail will work for your first drink—and slip into one of the hammocks. You can smell the salty sea breeze, hear waves crashing, and feel the warm sun. Perfeito. There are a lot more Brazilian beach trips in your future now.